It has been decided that Barbara Gray will do an all-class session called “Using Social Media for News Research and Reporting” on November 16th, so that will not be my next time in class, after all. Barbara is definitely the guru on this subject. Instead, I will present a lesson on “backgrounding resources” the AFTERNOON of November 9th, and a session titled “Mining the web like a pro: Google and beyond” the morning of November 30th. Please note these changes to the original syllabus. Nothing changes with the due date on the research-inspired enterprise story (November 10th) or the date of the research quiz (December 7th). See you again November 9th. Another way is to seek out local or national organizations related to the topic. One of my favorite tools is the Encyclopedia of Associations, an “old-fashioned” print resource available in our Research Center. Online, you can use the school’s Associations Unlimited account or the universally accessible Gateway to Associations. Government experts can also be useful. Any New York City reporter should have the latest copy of the Green Book. I finished with half of the beat memos last weekend. Since I’m dealing with the enterprise pitches this week, I won’t get to the rest until the coming weekend. That also means I want all pitches resolved by then. Today’s bonus: Charles Wilson has some more thoughts on cops and crime research. For anyone wondering about the beat memos, I plan to start getting them back to you this weekend. I’ll review them in the order I received them, so those of you who used the “extra time” Tuesday will get them back later. I’m not sure I’ll finish this weekend, but I promise that everyone will have them back by the time I see you next on October 19. Today’s bonus: Check out this CJR article that Judy Watson sent around, which includes tips for how writers should handle research so that they don’t plagiarize. I want to simplify this project as much as possible. It should be a three-step process. Find a newsworthy statistic that interests you. Use reporting, and possibly more research, to determine and explain why your number compares as it does. This will certainly involve identifying and interviewing experts on the subject. In addition to getting them to explain “why,” you’ll probably want them to make suggestions for how to improve the number and/or predictions for the future. Your grade will be based on how well you handle items 2 and 3. I’m expecting 800-1000 words. Pitch is due 10/12. (Feel free to contact me sooner, because if not approved, I won’t allow much time for a re-pitch.) Story is due 11/10. Back-end research: Don’t conjure up a story idea and then try to figure out how to fit (statistical) research into it. That’s backwards. The research is supposed to inspire the story. In fact, don’t even bother making a pitch unless you already have the data that inspired your story idea. Once you start writing, if you find yourself several paragraphs into the story before you’ve mentioned any numbers, you’re also “back-ending” it. A research-inspired enterprise story needs the research up high. If not in the lead, then shortly thereafter. Numbers without context: Reporting that there are 27 widget manufacturers in your CD means nothing without context. How many were there five years ago? What is the difference from the average CD? Get it? Some kind of comparison is vital. Chronological or geographical comparisons are two of the most common and accepted. Statistical overload: Don’t operate on the “more is better” principle. All you really need is one good statistic to inspire your story. That’s not to say you’re limited to one, but don’t bombard. Cramming too many numbers into a story often clouds the theme or makes the necessary backup reporting too unwieldy. Helpful hints: Interesting statistics you found while researching your beat memos may make for good story ideas. Many of the sites listed on my NYC.gov handout are treasure troves of statistical information. Don’t forget that your CD beat memos are due to me Tuesday, when we’ll discuss “cops and crime” research in class. Please note that there will be a more comprehensive lesson on court research in Craft II. Before I go, big shout out to my AmeriCorps friends at the Phoenix of New Orleans and the Habitat for Humanity ReStore–Chris, Jen and Will, Amanda and Melissa. AmeriCorps does fantastic work and is a great way to offset those student loans too! While I’m on the subject of New Orleans, I should also plug the recent video directed by the J-school’s own Bob Sacha. Excellent job! 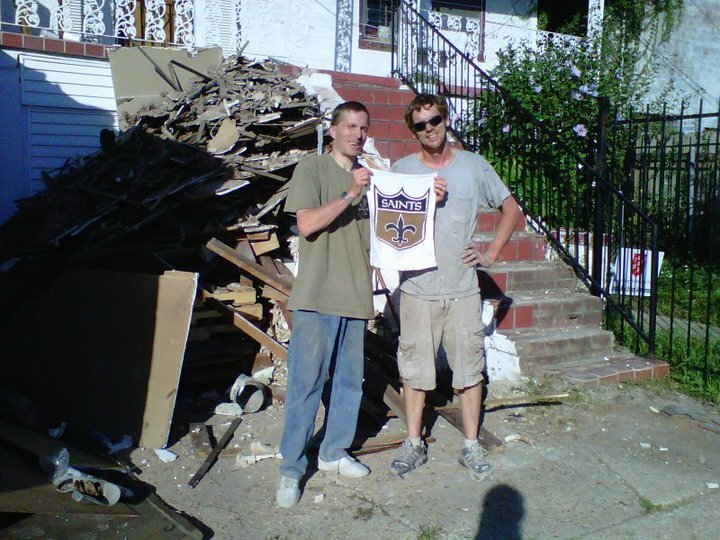 Jack and Chris Glynn celebrate their favorite team and a week of interior demo. 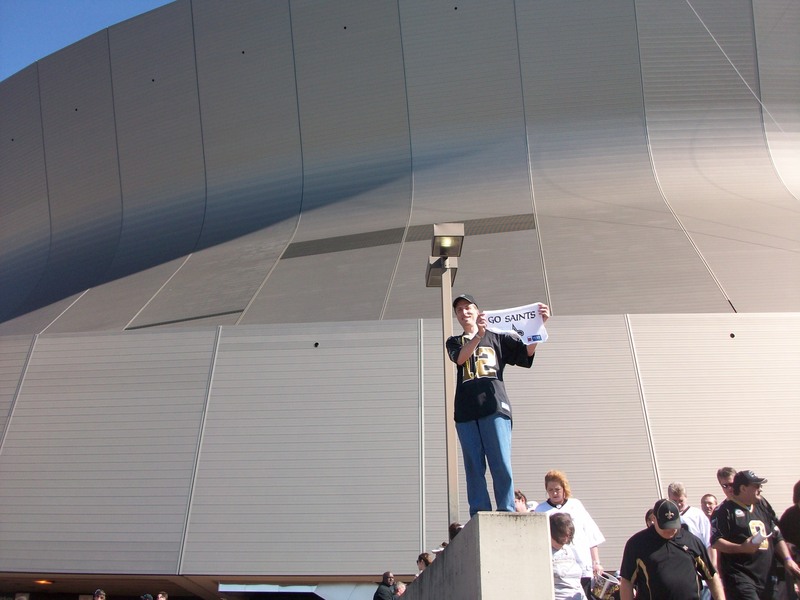 Breathing a sigh of relief after the Saints close win today at the Superdome.